Michael lived between Washington DC and the Chesapeake Bay in the eighties where he mastered seafood recipes and products of southern Maryland and Virginia as he developed his catering skills. At this time of his career, he started collecting food Mecca experiences by traveling to the great food cities and regions of the world such as New York City, San Francisco, New Orleans, Paris, Rome, Barcelona, London, Athens, Tuscany, and Provence. 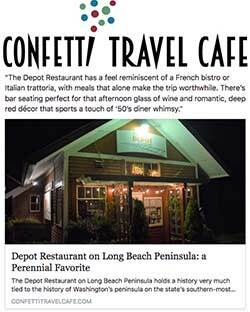 Depot Restaurant Chef Michael Lalewicz’ cheffing experiences have been as diverse as the cuisine’s of the countries he has traveled to. Michael was Sous Chef at Portland ‘s Restaurant Toulouse, Oswego Lake and Persimmon Country Clubs. He developed and opened the Greek kitchen of Portland ‘s premier jazz club, Jimmy Mak’s. 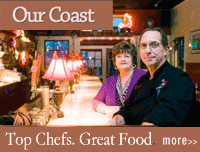 Michael served as Executive Chef and innkeeper at the Shelburne Inn on the Long Beach Peninsula. Michael has always managed his own catering business as a mechanism for development of his exotic food creations. 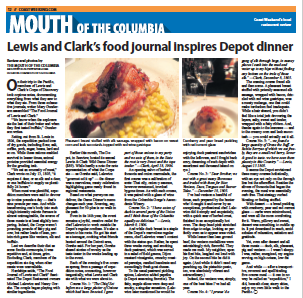 As owner and Executive Chef of the Depot Restaurant in Seaview ,Washington, he is able to create gastronomic delights for guests each day of the week. He is a graduate of Western Culinary Institute. It's 1:10 AM — Until tomorrow!